Being one of those people who loves going to Pilates classes but then can never remember what to do when I get home, I was delighted to read this book. A quick glance showed that there were clear diagrams and instructions so I’d be able to enjoy Pilates without my teacher reminding me what to do. But this book is far more than just instructions. It explains why you are doing the exercises and which part of the body is benefitting – something I found really useful. Aimed at all levels from beginners to advanced and with clear guides to workouts for each level, this book is suitable for all. While I’m not a beginner, it was useful to be reminded of some of the basics. The ‘how to use this guide’ section is excellent and along with covering the basics, demystifies breathing techniques – something which has always confused me. 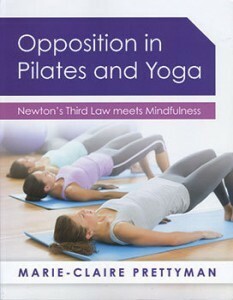 There’s also a section on mindfulness and how this can help with Pilates and yoga. Author Marie-Claire Prettyman, who is based in Southampton, argues that what you feel in Pilates and yoga is as important as what you do and to really reap the benefits, you have to do more than just execute some vaguely accurate moves. It’s about what you feel when doing the exercises and where your head is at the same time. Having worked as a yoga and Pilates teacher for over 15 years, Marie-Claire recognised that not all poses were suitable for everyone, something I can relate to. She predominantly worked with people who had injuries, were in pre- and post-surgery and had illnesses such as cancer and multiple sclerosis, and adjusted routines to suit people’s specific needs. After years of experimenting, she has utilised Newton’s Third Law – for every action, there is an equal and opposite reaction – to allow you to feel whatever you need to feel, not what instructors dictate you should be feeling. Don’t panic – the book makes this easy to understand. And did this book work for me? Yes. I found myself really thinking about how I was moving and being comfortable in how far I stretched. I did stop worrying about breathing and let my body just do what felt right. I can now understand why people get addicted to this type of exercise.